In this post I'm going to probe a rather ambitious topic: the role of education in relation to caste formation. What makes it even more ambitious is that in lieu of descriptor based approach, I'm going to see what's required to get there via ground-up evolutionary theory. I'll skip evolution theory basics and start of by referencing David Sloan Wilson's 2x2 matrix comparing self-effects vs. group-effects in religious and homo economicus groups. Transition between two stable moral equilibria leads to between-group heterogeneity (different morals for different within-societal groups). Next, I'll try to reduce things down a manageable game-theory scenario. This will involve a fair bit of variable filtering. Reduction will occur via cultural transmission tools and some basic organizational theory. Cultural transmission will then be used a second time to analyze the likely evolution of surviving scenarios. This will yield a set of quasi-stable states that describe commoner (producer) - coordinator (elite) morality and behavioural expression. At the end I'll tie things back to education. This will be done by verifying whether "education" has the potential to mediate stable state tensions. But watch out, the process is long, and at this stage of the game, lots of hand-waving is involved. The purpose isn't to prove things academically... it's to see what evolution theory can potentially say about caste formation, particularly in terms of the physics to which institutionalized public education is subject. 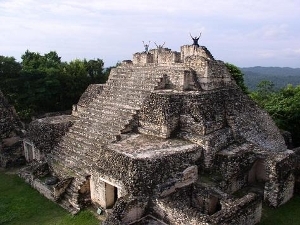 This last summer I got the chance to climb around a number of Mayan ruins in Belize. Are there structural differences between aristocratic education and commoner education? If so why? What might these differences entail? Why do we expect our own education system not to fall into (or perpetuate) historic types of social dimorphism? Does education respond to, drive, or simply resonate class separation? Over the last year, I strongly suspected these questions were impossible to answer. Perhaps they are. However, Wilson's recent book, Does Altruism Exist, had a chapter that, I think, filled in enough holes for me to naively imagine a way through an exceedingly complicated causal quagmire. In this post I'll layout a rough sketch to see if my thoughts are plausible. The intent is to see to what extent the dynamics described by multi-level selection theory illuminate deep educational questions that otherwise are stuck in the realm of speculative sociology. Along the way we'll hit some interesting points about elite (coordinator) - commoner (producer) dynamics. In fact, most of the journey will focus on establishing a solution space from which to quickly and superficially jump into the educational caste question. The whole process will have a number of interesting tie-ins with Peter Turchin's secular cycle work. The work David Sloan Wilson did using multi-level selection theory (MLS) to understand religion showed that evolutionary tools have promise for social analysis. Evolutionary tools provide a first principle approach to social system tensions. The problem is, how far can we take these tools. Specifically, what do these tools reveal about caste formation, education, and education's uncertain role in caste formation? Part of Wilson's background work in this field involved analyzing Hutterite belief structures (a luddite Christian sect which emigrated from Germany to western North America). He used a 2x2 matrix to characterize expressed social beliefs in terms of individual vs others benefit. This was done via inferred measures of relative fitness. Here's the table he produced. The interesting finding was that other successful, stable religions had no mixed benefits: world views (morality) were either win-win (+ for self & + for others) or lose-lose (- for self & - for others). Indeed a Templeton conference on the topic found that leading scholars from the major world religions said that their religions' beliefs did not meet classical definition of altruism: altruistic actions were, in effect, transactional (albeit often on a supernatural plane for future imagined rewards). A similar black & white solution emerged. Wilson explains this with a functional analysis. Mixed solutions are unstable because they have lower relative fitness: they are either not motivating & hence don't succeed in the between-group selection world, or they are too costly & hence don't succeed in the within-group selection world. In other words, mixed cases don't thread the eye of the multi-level selection needle*. Let's take Wilson's findings at face value and assume both the classical religious (table 1) and Randian (table 2) position are different proximate solutions to the same ultimate functional problem -group coordination in the context of between-group & within-group selective tension. Of course, there can be an infinite number of proximate solutions to any ultimate problem. However, in terms of highly moral systems, Wilson's empiricism (which certainly isn't a census of possibilities) has only provided two. We'll go with what we have. To compensate for this first source of potential error, well 'd our best to accommodate some looseness as we build up our structure. Individual switching from one state to another can produce within-group heterogeneity. Are these conversions possible in human moral groups? I can't see why not. Self interested Wall streeters have become religious: religious people have become self-interested Wall streeters. However, common observations suggest conversion rates aren't high*. Does low conversion/migration lead to within-group heterogeneity? For a major orientation like group-interest vs. self-interest, the answer seems to be no. Exploitive freeloading seems to be the major dynamic at play in this type of human group. Migration is perhaps a second order term. More on this later. Right now we'll just talk about Wilson's empiricism. Wilson's empirical altruist vs. self-interest moral matrixes are about as mutually exclusive as you can get. (Even Trump might not be able to reliably espouse them both). However, by definition, non-zero conversions/migrations do lead to some level of heterogeneity, for some period of time. However, within-group heterogeneity is dampened by cultural norm enforcement (which would be extremely high in cases of mutually exclusive morals) and other within-group pressures. The whole scenario is yet another instance of between-group selection vs. within-group selection tension. Wilson's empiricism suggests that in this case the tension only produces binary morals (at least morals which are stable). Here's how this plays out. There's been lots of work exploring the mechanisms by which polarization propagates. For instance, Timothy Ryan's 2013 paper on the political consequences of moralized attitudes suggests that moralized attitudes reorient behaviour from maximizing gains to adhering to rules. (I'd add, that nothing per se prevents these rules from being either altruistic or Randian). Ryan's work, like many other's, suggests moralized attitudes lead people to oppose compromises and punish the opposition. In conclusion, a multi-level approach often sees within-group heterogeneity as a case of separate lower level homogeneities. Within our theoretical (and real) society we have groups of classically religious altruists and groups of Randian self-interesters. Therefore our societal group level is morally heterogeneous, but at a lower level we have morally homogeneous groups. While reduction ad naseum is possible, we'll leave things here. Interested folks are directed to Mckelvey, Lichtenstein & Andriani's excellent scale free organizational theory work. As was mentioned, migration is one way to maintain within-group heterogeneity in environments which otherwise lead to single state equilibria (see Okasha or Wilson, or any of a heap of other evolution biologists here). Wilson backs this fact up with a number of fairly conclusive experimental studies which show that migration levels need to be fairly "high" to maintain heterogeneity between "altruists" and "self-interesters". As already mentioned, in a case of two mutually exclusive moral states, it is expected that migration rates would need to be very high to overcome the damping effects of norm compliance against polar opposites. Thus, in our world of classical religious altruistic morals, Randian self-interested morals, and observed rates of migration between them, migration is unlikely to be a source of substantial within-group moral heterogeneity. (standard distributions will of course still apply, sigmas will just be tight). The more homogeneous a group is, the more potential benefits there are for corruptive freeloading. However, norm enforcement becomes commensurately stronger. A lone altruist can infiltrate a group of self-interesters and outcompete them by forming a sub-level between-groups. A lone self-interester can infiltrate a group of altruists and outcompete them by freeloading. This is done by successful within-group competition. 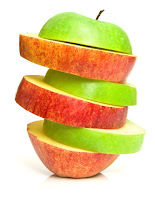 Function at a high level of selection requires the minimization of lower level competition. Conflict minimization can enable heterogeneity (albeit temporarily if there are fitness differences and no balancing tensions). What proximate solutions minimize this ultimate constraint? One solution is to suppress any tools that could be used for exploitive self-interest. However, in a modern globalist world, forced suppressions (strong man dictators) tend to be unstable over time. What about a mutually agreeable rule-of-law strong-man? Evidence shows this solution is gaining ground, and perhaps facilitating a cultural move to a higher level of selection (a socially-progressive-open-border world, aka supranationalism). However, as a stable suppression tool, 2nd amendment gun debates and migration crises certainly show this particular move to a higher level of selection doesn't have the strength to fully minimize within-group competition (...yet). Extreme dependence. The more dependent people are on each other, the less likely they are to destroy their mutually supportive environment. I believe MacIntyre's networks of giving and receiving is a trendy treatise in this direction (at least among economic philosophers). He supposes that mutually dependence can stabilize virtuous behaviour. The Hillary email scandal. One set of rules for the little folk, another set of rules for the important folk. Extreme dependence is facilitated by role specialization. In uneducated situations, roles need not require lots of proprietary skills, just the appearance of such. Medieval guilds come to mind here. Skills were largely thought to be non-portable. Perhaps they were, at least to a number of people, or to a level or artistic mastery. But they certainly weren't to everyone, nor to a "good-enough" level. Especially not to the extent guilds would have had people believe. I suspect the same is true of today's CEO and political elites. Roles are essential, but interchangeability between roles, is perhaps artificially or purposefully dampened. This is the educational tie in we'll eventually get to. So, in a case of low migration, between-group selection, and within-group selection, we get a society with multiple homogeneous moral groups. Conflict between these distinguishable groups can be minimized by extreme dependence and/or distinct rules (and perhaps other mechanisms not discussed). Another interesting point here is Gunia and Kim's (2016) recent paper of the behavioural benefits of other people's deviance. Other people's deviance surprisingly increases the work levels of conformists. Conformist dissonance is decreased as deviator distance / perceived separation is increased. We're interested in exploring commoner (producer) - coordinator (elite) interaction. Most societies have minimal migration between these groups. Rather than rigorously verifying if commoner-elite migrations levels in societies are enough to match the high biological migrations levels necessary for heterogeneity, we'll stick with common sense empirics and reasonably assume that migration levels are "low" enough to keep within-groups homogenous "enough". While we've made a cursory case for societal heterogeneity via within group homogeneity, I think it behoves us to explore it in more detail. This time, let's look at it from the perspective of time stability. Empiricism provides a strong answer to this question. Wilson's empirically observed a number of religions. Their morals were similar. While the n was very small, experience backs up his findings: religions value community and abhor self-interest. Indeed, academics like Norezayan have argued that religion was the key cultural evolution change that facilitated the emergence of beyond-tribe civilization. Facilitation happened via imaginary moral big brothers, their 3rd party moral standards, and their imaginary supernatural enforcements and rewards. The result was enough self-interest suppression to allow (group) selection at a higher level. Let's go to the moral enforcement literature for some more support for within-group moral homogeneity. Moral enforcement literature, like that by Ryan above, suggests within-group heterogeneity with respect to fundamental moral rules is, generally, unstable. Groups which can't judge/punish individual moral behaviour lack the conditions necessary to be adaptive units at the between-group level of selection. Judgement aggregation work by List & Pettit suggests groups bias actors via the emergence of group morals. Norm enforcement occurs in terms of acquiescence to group moral intentions, not to specific propositions. Let's explore what evolutionary transition theory has to say with regard to competition and levels of selection. Macho & Roze (2000) summarize the evolutionary transitions literature from a multi-level perspective. There is pressure for moral homogeneity within groups. However, populations tend to be normally distributed. In free-loading terms, this means pure moral homogeneity is an illusion. However, as we've already argued, standard deviations are likely to be small and directly related to the quasi-relgious nature of the group (whether the quasi-religion be supernatural, atheistic, or agnostic in doctrine). But, mixed morality within a group doesn't match up with Wilson's findings. It doesn't do well in game based multi-level selection accountings based upon individual and group benefits. Therefore we have two groups, which, while distinct are fairly homogeneous within each one. If the group is large enough, this homogeneity can polarize into distinct sub-groups. Again, at this point we have up to two homogenous groups distinguished by their mutually exclusive moralities. Migration levels minimally disturb homogeneity. We've discussed two ways to minimize between group conflict: extreme dependence and different rules/morality for different distinguishable groups. Now we'll flush out group-size effects. This is necessary because our aim to is explore the commoner (producer) - coordinator (elite) dynamics which might relate to caste formation. As we'll soon see, (relative) size matters. The development of arbitrary conventions by the tendency to conform to the majority has the additional effect of solving coordination problems in social interactions (e.g., driving on the left or the right side, signs of approval and disapproval, or making contracts; see Skyrms, 1996). According to Alvard and Nolin (2002), such solutions to coordination problems are necessary for successful mutual cooperation. Several studies showed that common knowledge serves such a coordination function (e.g., Metha, Starmer, & Sugden, 1994) and is necessary for individuals to assume (indirect) reciprocity, which again facilitates cooperation (Yamagishi, Jin, & Kiyonari, 1999). With respect to leadership, organizational theory, anthropology, group dynamics, and network theory agree that leadership (formal or informal) is essential for large groups to survive. In anticipation of flat hierarchy critiques, let me just say the flat organizations simply increase informal - emergent leadership at the expense of formal role-based leadership. Leadership doesn't disappear, it just becomes more fluid. Larger groups face the tensions of between-group and within-group selection. Large groups are facilitated by relaxing norm enforcement. This enables group size to increase. However too much looseness causes group implosion: corruption costs exceed group related individual benefits. Between group dependencies stabilize between group heterogeneity. Now let's look at all our variable to see if estimating the "cost/benefit" of each is feasible. The intent is to "game" a least cost solution. Some back-of-the-envelope logic might filter things a bit. 1. Organizational theorists make a pretty good case that coordination is essential. 2 & 3. 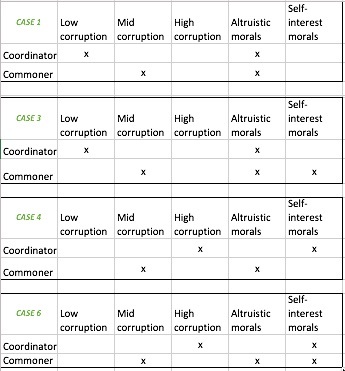 Equation based modelling suggests group size is directly correlated with corruption levels: positive with low corruption, negatively after a corruption threshold. Thus small groups either have low or high levels of corruption while large groups have moderate levels of corruption (I'm obviously ignoring non-steady states....). Coordinator (elite) group size is all but guaranteed to be smaller than commoner (producer) group size. Food pyramid logic applies. 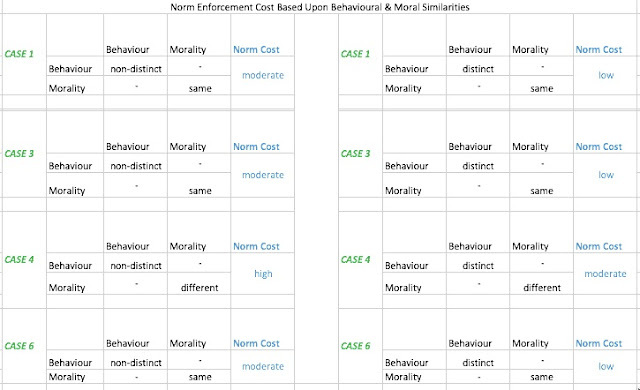 The take away is that norm-enforcement correlates with corruption which correlates with group size. 7. Recursion between group dependency, coordination and group size also helps a back-of-the envelope approach. The larger the group, the more coordinators and followers (producers) will depend upon each other. Role specialization is likely. 8. Malthusian logic suggests coordinators should be fairly sensitive about immigration, but not too concerned about emigration. Two percent migration from 100 coordinators into 10,000 commoners will have little effect. Two percent migration of 10,000 commoners into 100 coordinators will have significant effects. Observations of elite - commoner migration suggests it happens, albeit to different levels. Meritocracies tend to have more migration between elite and commoner classes than mature hereditary systems. As previously mentioned, migration is unlikely to substantially effect within-group homogeneity. Additionally, cultural evolution work by Richerson and others illuminate the role of prestige bias, vertical transmission and horizontal transmission. The relevant take-a-way is that success gets copied. low or high corruption with low or high norm enforcement. A high corruption state likely has high individual norm enforcement costs and is likely reactive. A low corruption state likely has low individual norm enforcement costs and is likely proactive. It's probably good to point out that I'm going to simplistically assume commoners have less prestige than coordinators. For example, actors have high prestige by aren't what one would normally think of as a coordinator. So let's just expand our definition of coordinator to include individuals that don't just coordinate the work of subordinates (a typical leader), but also coordinate sociality. In other words, were I to use a functional definition of coordinators, it would be in terms of their dependency upon commoners (producers) for survival. Now the type of cultural transmission within each group, while an interesting speculation is superfluous for staging game based assessments. Similarly we don't have to worry about relative group sizes much - as mentioned there is a negligible chance that a society will be able to support more coordinators than commoners (producers). This leaves corruption and moral orientation as primary terms. Our back-of -the envelope logic has reduced our solution space down to two dimensions! This brings the number of cases we need to look at down to six, as can be seen below. Case 1 is the utopian state: everyone is altruistic (albeit commoners more in a lip-service way than coordinators). The classic downfall of utopian altruism is its neglect of the exponential advantage cheating has in increasingly homogenous groups. Thus the cheating payoff for individual coordinators acting in exploitively self-interested ways is high (cases 1-3). meritocratic advancement from the commoner class via selection for the most altruistic. Altruistic commoners (case 1) can switch to self-interest (via a case 1-3-2 progression). Prestige bias from altruistic coordinators to commoners should mildly dampen commoner progression to self-interest. The main damping factor though, is probably commoner's own norm enforcement. People have exquisite freeloading detection heuristics concerning those who dip their feet in the world of freeloading. Of course some people can cover themselves better than others. What you therefore get is case specific instances of self-interest covered by superficial adherence to group morals (one form of case 3). In the freeloading world, self-delusion is a strong evolutionary strategy (e.g. the insurance company expects me to inflate my claim a bit, hence the deductible.) As freeloading by an individual accrues, observations suggest there's a commensurate switch from exception-based altruism to a disguised self-interest. Basically, individuals cut off moral guilt and the risks of its ingrained tells by fully rationalizing strong self-interest. A quick commoner phase change from altruism (case 1) to self-interest (case 2) largely skipping heterogeneity (case 3) is also possible. This is probably reflective of a collapse into anarchy via rapid norm enforcement swamping. Case 2 just seems unstable. Common sense suggests that self-interested commoners should, generally, have a low probability of stabilizing at mid-corruption levels without some pressure or strong selective force for altruism. Moderate corruption and self-interest prime moves to high "corruption". Indeed, our whole discussion started off with Wilson's findings that morals stabilize around transactional altruism or pure self-interest. Case 2 is, according to Wilson's findings, empirically unstable. However, we can't rule out the potential case where a strong rule of law (and effective technocratic legal system) might keep case 2 (commoner self-interest & mid corruption) devolving to destruction. It just seems likely that, over time, coordinators would game themselves into a commensurate level of corruption (case 5). We'll touch on this weak argument a bit more later. Right now, we'll assume (with weak support) that case 2 will likely devolve into case 5. 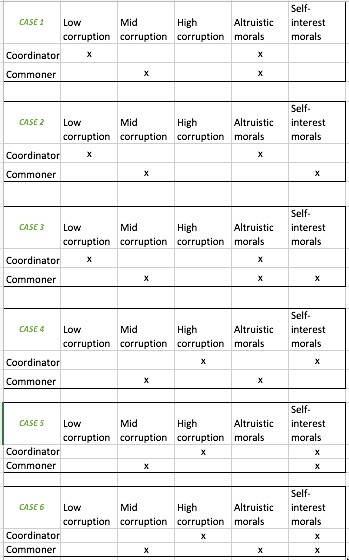 What all this suggests is that the likely scenario with respect to low coordinator corruption is stabilization at case 3 (mixed commoner morals) via the emergence of pockets of altruistic commoners and pockets of self-interested commoners (remember the literature I cited on polarized landscapes...). High rates of corruption quickly lead to catastrophe, but, some corruption is required to enable large group size. Another alternative is for coordinator prestige bias to dominate commoner's shift to self-interested morals. In this case, prestige bias dominates over the strength of within-group competition. Commoners don't cheat because they see successful coordinators acting altruistically and mimic that supposedly fitness enhancing behaviour. This would lead to a case 1 end state. (I have my doubts though, that such a case is stable in a non-self selected group of a large size without high religious-like dynamics.). Or, if tensions just balance, case 3 stability. If case 3 balances, equal tension with between-group selection and within-group selection should produce complex cycling. See Okasha here. Coordinators increase their corruption levels by quickly jumping past mid level corruption to high level corruption. This gets them past the Malthusian trap induced by moderate corruption's large-group enabling tendencies. Because coordinator numbers have to be much less than commoner numbers, population crises are a destructive constraint. Only high or low corruption levels (or low birth rates and no immigration) enable low coordinator numbers. 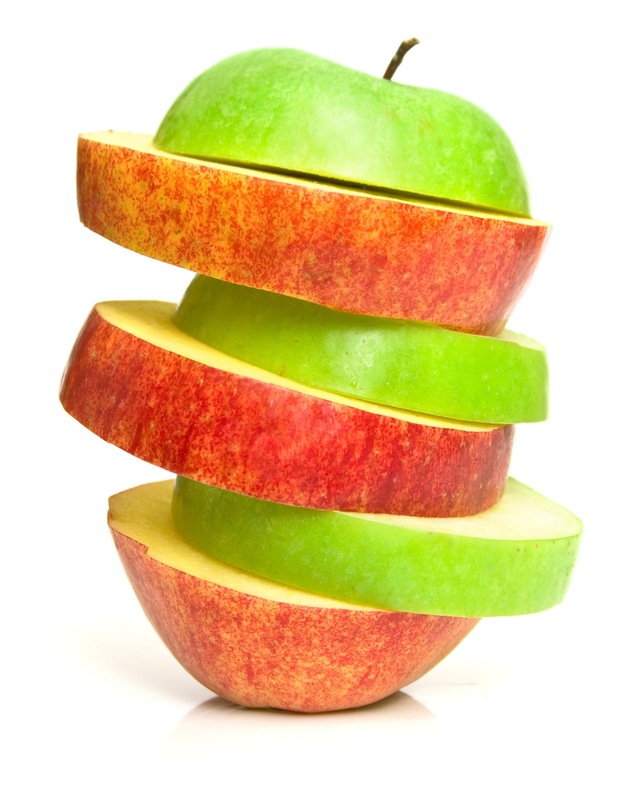 Thus, over long periods of time, one would expect to see selection for rapid coordinator phase changes. Those that don't change rapidly enough exceed coordinator carrying capacity and, if Peter Turchin's structural-demographic theory is right, this precipitates total societal collapse. The degree to which selection for such rapid phase changes has historically happened is, of course, completely uncertain. Continual societal collapses ala Turchin's elite overproduction evidence suggests phase change rates are too slow. But the durability of larger-than-tribe groups suggest the things are not ubiquitously catastrophic. However, such speculative will have to remain tangential. One thing that is certain though is that in two group scenarios, high corruption levels among coordinators need not be as destructive as that predicted by single group models: coordinators can after all, parasitically freeload off commoners. coordinator phase changes from altruism to self-interest should be rapid (but this is certainly not definitive). Now, let's look at how cultural transmission affects cases 4-6 (self-interested coordinators). We've already discussed many of the dynamics around commoner moral progression. The main difference between cases 1-3 and 4-6 is that in cases 4-6, coordinator prestige*** bias pushes commoners to self-interest rather than away from it. This basically suggests that either case 4 (the doppleganger of case 1's altruistic commoners) is unstable, or that commoner norm enforcement is strong enough to dominate over both coordinator prestige bias and within-commoner-group selection for self-interest. This is certainly possible. 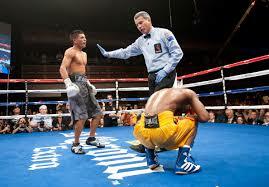 Conflict between commoners and coordinators is likely (they have opposite morals). Unless, of course, something like 'different rules for different' groups can justify the all-but-inevitable coordinator freeloading. Without such de-escalating mechanism, another possibility is commoners pushing coordinators into a case 1 (coordinator altruism) mode. What's more likely in case 4 though, is that coordinator prestige bias plus within-group selection for self-interest dominate norm enforcement stability. Noise in these values facilitate temporary periods of norm enforcement weakness. Pockets of self-interest creep-in, and a case 6 scenario emerges (self-interested coordinators and mixed commoners). Case 5 just seems inherently unstable. The combination of highly corrupt, self-interested coordinators prestige biasing self-interested moderately corrupt commoners spells doom for group stability. Commoners should quickly change to high corruption levels lowering the group carrying capacity. Fully self-interested groups are unfit in between-group competition with altruists. Case 6 suffers from 3rd "world-itis". Coordinators are corrupt. Pockets of commoners are corrupt. Top-down change is unlikely. Individual commoner survival is likely based upon alliance with strong-man coordinators or strong sub-groups. Between-commoner selection is likely a strong factor. To get out of the likely evolution to case 5's implosion, between-commoner selection must favor altruists. If not, bias from coordinators all but ensures case 6 turns into case 5 and then implodes. Case 4 stable if norm enforcement (& quasi-religious coherence) > within group selection for self interest + prestige bias. This is unlikely. 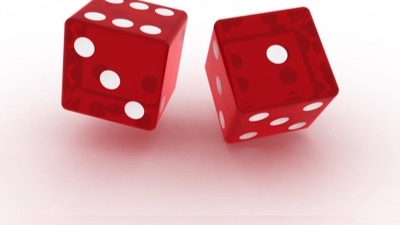 Case 6 is unstable unless between-commoner selection favours altruistic commoner sub-groups. Empirical evidence of human groups suggests selection favouring altruistic sub-groups is likely. All this means we only have four cases to look at for possible end-behaviour. Case 3 may capture the scenario where altruistic leaders are trying to lift their citizenry up to higher levels of altruism. I suspect historic periods of this dynamic have been at least partially responsible for human evolution to ever-higher levels of selection. The problem with this, which we'll explore in more depth later, is that long periods of altruistic coordinators in environments of mixed moral commoners is unlikely. Cancerous coordinator self-interest is hard to resist. Case 4 seems to be the modern re-interpretation of feudalism: honest peasants are abused by a self-interested nobility. Again the obvious problem with case 4 is why would peasants put up with this? You'd expect pockets of self-interest to develop. Or, you'd expect conflict between commoners and coordinators to come to a head. Case 6 seems most similar to pessimistic perspectives of modern society: Commoners are a mixed bunch and coordinators see how far they can stretch their own self-interest. 3rd world manifestations of this state likely have weak technocratic enforcement mechanisms. 1st world manifestations of this state likely have strong technocratic enforcement mechanisms. The presence of a rule-of-law Big Brother or equivalent quasi-religious Big Brother is key for case 6 stabilization. 1st world countries tend to rely on rule-of-law. 3rd world countries tend to rely on religious or quasi-religious (e.g. tribal culture) Big Brothers. We've now shown that each end-case meets a minimum standard for potential reality. We'll now analyze our four cases using two different methods: 1) suppositions of long term change paths, 2) behavioural differentiation costs. However, altruistic homogeneity is unstable. Technically the instability occurs in instances of within-group selection. If there is a non-zero chance of spawning a self-interested actor who can game norm-enforcement mechanism, then self-interest should expand cancerously (undetected one-off freeloading always has high relative fitness). We can of course, assume within-coordinator norm enforcement can dampen this. However, with two groups can within-coordinator norm enforcement dampen coordinators who may freeload off the commoner group? I suspect the chances are low (or at least lower than within coordinator norm enforcement). After all, there is little immediate benefit from such action. Norm enforcement has costs. As separation from the other group increases, personal norm-enforcement pay off decreases. Another way of saying this is that the "leakiness" of norm-enforcement is proportional to the distinctness / differentiability between groups. This suggests self-interested co-ordinators are probable because they can parasitically freeload off another group. But let's look at each case in more detail rather than jumping to a rather large conclusion. We'll start at each case and just like in soft-sociology we'll uncritically predict each case's change path. In lieu of rehashing all the old supporting arguments, I'll keep things brief. While case 6 seems stable, the most likely change path is to case 5: implosion. There is also non-zero probability of miraculously flipping to a case 3 scenario (coordinator = altruist, commoner = mixed). There is also a non-zero probability of moving to case 4 (coordinator = self-interest, commoner =altruist). Although, this latter move seems very unstable. Case 6 (coordinator = self-interest, commoner = mixed) is a natural well. This is both intestesting and problematic because case 6's most probably change path is to case 5: implosion! Other change paths are certainly possible. For example it is entirely possible for environmental conditions to favour a move against the entropy of self-interest. Indeed that's a fundamental tenet of multi-level selection which suggests between-group selection balances within-group selection (despite naive 1970's thinking otherwise...). While I won't make the case for it in this blog post, I suspect we'd see complex cycling around case 6: there would be fluttering between case 3, 4 and 5. We've mentioned how between group distance (specifically differentiability / distinctness) is (inversely) proportional to norm-enforcement leakage. Norm-enforcement leakage is often fitness enhancing if you're successfully transitioning to a higher level of selection (aka becoming a super-group). Norm enforcement leakage is often fitness decreasing if you're moving away from a higher level of selection (aka tribalizing). Norm enforcement has costs. Detection costs and false-positive false-negative frequencies are higher between dis-similar individuals than between similar individuals. Let's call this idea of distance / differentiability / distinctness, 'behavioural differentiation'. We'll make a liberal assumption that mixed morals don't result in necessarily distinguishable behaviors. 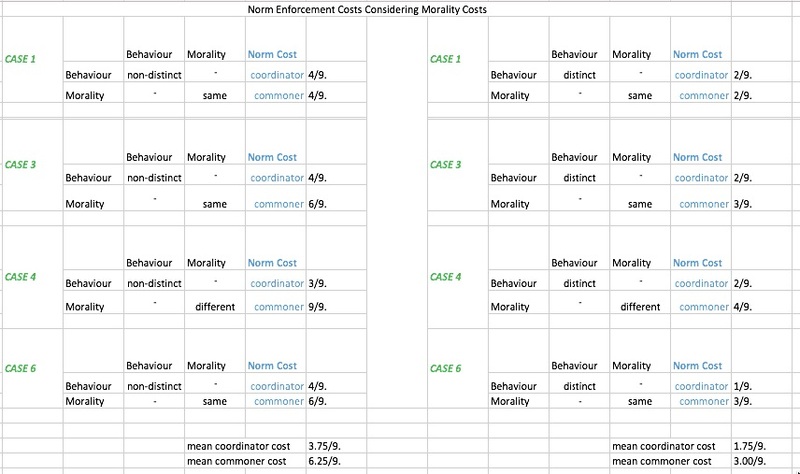 We'll also devise some assumptions about norm enforcement costs. Here's the reasoning. Distinguishable behavioural signals make it easy to determine who's in your group and who's not. This lowers the cost of norm enforcement. You're erring in trying to norm enforce people outside of your immediate group. 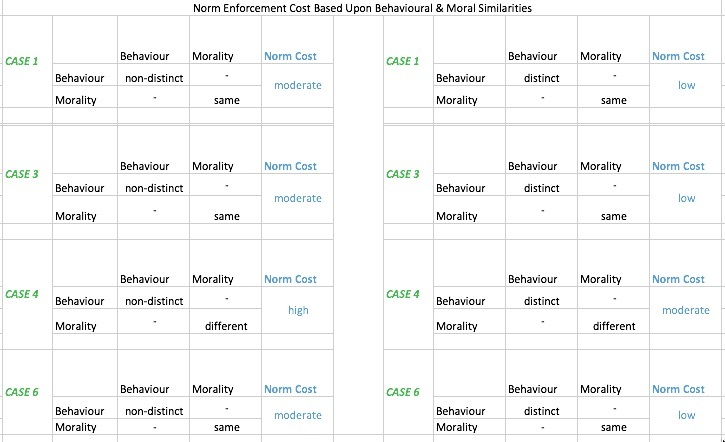 Similarly, identical moralities lower norm-enforcement costs. This is because of better insight into your own type of morals. You get the following table (which explores the situations where behaviour is and is not distinct/distinguishable). But now we have to multiply by the enforcement costs of altruism or self-interest. Self-interest will have lower norm-enforcement costs because when everyone is expected to go their own way, there are fewer norms to enforce. Mixed states will have the highest norm enforcement costs. Our table now looks like this. Of particular interest is that behavioural distinguishability greatly reduces the norm enforcement costs for both commoners and coordinators in every case. Of course, this is an artifact of our a priori assumptions to the same.... Nonetheless, its interesting to see what type of landscape this produces. Case 1 has the lowest net norm enforcement costs (for both the distinguishable and non-distinguishable scenarios). Case 6 also has low net norm enforcement costs. If norm enforcement costs are the prime concern, then coordinators should favour case 6 with distinguishable behaviours. Commoners should favour case 1 with distinguishable behaviours. The last filter to apply is migration. As mentioned before, coordinators are expected to be sensitive to immigration. Thus, distinguishable behaviours and distinct moralities should be favoured (they increase migration costs). This favours case 4****, which we're labelling (extremely loosely) feudalism. Not far behind are case 3, benevolent builders and case 6, modern society. Case 3's trajectory results in gradual increases to coordinator immigration. This happens as commoners become more altruistic like their coordinators. This lowers emigration costs (commoner to coordinator) because of the similarity rule. Altruists immigrating into a group of altruists is minimally problematic. Altruism is weakly subject to within-group competitive factors. Case 6's trajectory (the most probable of which is to case 5 - dual self-interest) is also towards similarity. Commoners are becoming more self-interested like their coordinators. This is problematic. It increases within group competition. Self interest is strongly subject to within-group competitive factors. Additionally, some recent research shows that people in power tend to be prejudiced towards those not in power. Coordinators should be biased against commoners. This increases the chance that coordinator freeloading is directed at commoners rather than their own group. Group morals stabilize around either altruism or self-interest. Mixed states don't seem empirically stable unless they occur via within-group pockets. Function at a higher level of selection requires the minimization of lower level conflict. Thus stable societies have ways of minimizing conflict between its constituent groups. Coordinating roles are essential in large groups. Large groups are facilitating by moderate amounts of corruption. But too much corruption quickly decreases group size. While lots of variables should be explored to game coordinator-commoner Nash equilibria, a feasible approach requires reduction down to 1st order terms. These seem to be corruption and moral orientation. This widdles the solution space down from more than 8! cases for a full problem down to 6.
case 1: a moral meritocracy. case 3, which is a temporarily stable situation of benevolent coordinators lifting up their corrupt commoners (temporality is due to random noise). case 4: something like feudalism where too-good-to-be true altruistic commoners put up with coordinator parasitism. case 6: 3rd world societies or pessimistic views of modern 1st world societies. Rule-of-law or strong moral-big-brothers maintain societal coherence. Case 6: modern society is a landscape well. However, entropy favours decomposition to societal implosion (case 5) as within-group competition (which favours self-interest) outcompetes between-group competition (which favours altruists). Case 4 feudalism is favoured by coordinators on immigration grounds. commoners who have pockets of altruism and self-interest and coordinators who are self-interested and direct their freeloading to the commoner group. If this is really a stable solution, we should expect to see multiple repetitions of its emergence across societies. We do. If it is stable, one should also look for social structures which facilitate this differentiation. I'd propose that education is such a vehicle. maintain a coordinator knowledge base of know how to direct/coordinate commoner effort. We'll have to deal with two cases here. One situation is where each group has the opportunity to create their own vehicle to preserve their desired stabilization. Tension between the case favoured by each group leads to case 6 stabilization. The other situation is where both groups rely on the same vehicle. Again, our analysis suggests commoners are likely to favour a mixed states for themselves (case 3 or case 6). Case 3 (coordinator = altruistic, commoner = mixed) is obviously better than case 6 (coordinator = self interest, commoner = mixed). Pluralism enables a mixed state. Social equity pulls back the between-group competition which occurs within pluralism. So commoners solution is to facilitate pluralism but to do so in a way to values altruism and equity. Wilson's classical religious morals do this (as would the equivalent secular and non-supernatural alternatives). Coordinators are likely to favour self-interest directed at commoners (case 4) in a way that is minimally antagonistic to commoners. The obvious solution to this is to convince commoners that coordination requires a certain level of graft. Education should also re-enforce the impossibility of commoners fulfilling coordinator roles. Aristocratic priest craft seems like a good solution here. I'd expect oblique transmission from priest to laity with unnecessary opaque and symbolically heavy messaging focussed on the value of individual sacrifice and group unity. Again, Wilson's classical religious morals seem to do this. The only caveat would be some additional messaging enabling co-ordinators to rationalize graft: something like "prosperity theology" works. As already mentioned, the aggregate solution for commoners and coordinators is case 6. The challenge with a single common vehicle is having a single message that is interpreted in different ways. This speaks to a hidden curriculum. Imagine a single educational system that encourages altruism and equity. But in practice its benefits are differentiated by socially opaque norms and threshold dependent benefits. Those with the social background and opportunities to benefit do so really well. Those who don't pass this threshold are entrenched into thinking they can't function as coordinators and that there is something they just can't "get" about that world. It should also encourage cliquishness while maintaining a sense of nationalism. Capitalism, the "American Dream", and high-standards public education are one of many possible intersecting solutions. Public charter schools which function as de facto class purifiers would also be part of a strong intersectional solution. This gives the appearance of openness while masking fundamental closed-off specialization. A necessary condition of the common vehicle education would be a focus on understanding commoners and commoner dynamics. Central to this would be assurances that the right class of people emerge as normative achievement champions. Thus the "right" type of answers endemic to a coordinator world-view would valued by the system. Trump-like blue-collar logic and pragmatics would be ridiculed and portrayed as destructive: after all, while understood by commoners it is not readily understood by elite. We spent an inordinate amount of time flushing out arguments for a socially heterogeneous society composed of two morally homogeneous sub-groups. We broadened the scope of Wilson's binary moral findings to include the possibility of mixed commoner morals. What we found was that self-interested coordinators and mixed morality commoners is a solution well. Evolution of this state (case 6) into complete self-interested implosion (case 5) must be mediated by some factors. Technocracy in the form of rule-of-law or Big Brother based religion (or quasi-religion) is one potential stabilizer. Education is another potential stabilizer. Distinguishability between sub-groups lowers norm enforcement costs. It also minimizes conflict between sub-groups. Role specialization (real or hyperbolized), dependencies, and group-specific moralities further minimize competition. Education can either be niche oriented to the needs / interests of each group, or it can be generalized for both groups. Niche specific education is well served by liturgeous symbolically opaque coordinator (elite) education. This increases migration costs into coordinator classes and entrenches distinguishability of the classes. Niche specific education is well served by altruistically oriented practices for commoners. This opposes natural pressure to ever-increasing levels of commoner self-interest which is destructive in the between-group selection world with other societies. Common education is well served by an elite focussed education that encourages altruism and equity, but which in practice has a high bar usually only passed by those with the right type of culture. This gives the appearance of equity while masking the ordinal race to ensure coordinators always come out on top. **Distinguishing between conversion and migration is fairly arbitrary. From here on out I'll assume, at our level of precision (non-individual specific), that the two events are interchangeable. ***Prestige bias isn't the only vehicle for cultural transmission. Seemingly irrelevant transmission types for our scenarios are oblique (1 to many), vertical (parents to children) and horizontal (social) transmission. Seemingly relevant transmission types are guided variation and content bias. Guided variation is characterized by individuals seeing something interesting and then modifying it. Sometimes this increases utility. Sometimes it refines it. Content bias is characterized by the intrinsic attractiveness of something affecting its adoption frequency. Both these forms of cultural transmission weigh the self-interest transmission vs. norm enforcement balance toward self-interest (at least in cased 4-6, in cases 1-3 it weights the other direction). There's also some interesting support for the evolution selection for high status. Higher status individuals have lower mortality than low status individuals. **** Case 2 is also favoured on the sole basis of co-ordinator migration concerns. However, it didn't pass initial filtering speculation. Oh, I should add, a note about why I only chose a limited set of cases in the analysis of their evolution. While progression to the non-limited set of cases is obviously possible, in a first order approximation I'm only interested in exploring what END STATES are likely. Thus while we lose precision about progression, we don't lose the main picture. We just get there quicker and more simply. I think this paper also adds to the general idea of the importance of distinguishability between elites and commoners and the value of obfuscating education which is internally intelligible but externally unintelligible. A very nice paper by Richerson that gets at the central points I was going for, albeit via actual rigour and a nice simulation.